What do you get when you add an older population to a poorly educated population? You get very low levels of workforce participation. 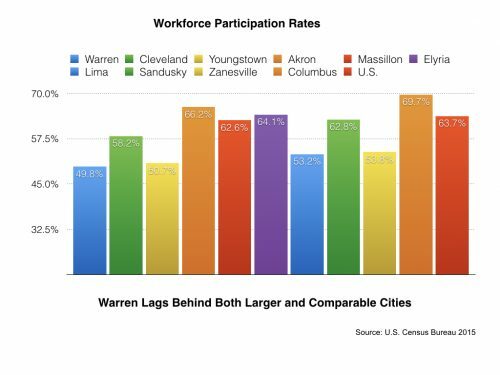 The chart on this page shows the percentage of the population, over the age of 16, who are active in the workforce, for Warren, nine other Ohio cities, and for the U.S. as a whole. Just under half of our population is working. I probably looked at 20 Ohio cities and Warren’s was the lowest participation number I saw. I selected these cities as examples of some comparably sized cities, plus a few that are larger larger. The U.S. participation rate of 63.7% is 28% greater than the Warren number. It is particularly painful to report that Massillon is nearly at the national index and far ahead of Warren. We even lag behind Youngstown, which, believe me, is no demographer’s dream city. Lower workforce participation means not only lower tax receipts, but lower retail spending as well. Posted Tuesday, March 21st, 2017 under Economic development.